Recently I have been on this homemade spice mix kick. Every time I buy a spice mix, particularly one that I use often, I wonder if I will be able to make it at home. I also possess a pretty stubborn streak, and if I don't get something right the first time, I will make it several times until I get it perfect. Then I blog it, haha... kidding! But sometimes that stubborn streak can be a pain in the proverbial behind. Like when I attempted to make this chaat masala, for instance. I love chaat masala. For those who have never heard of it, chaat masala is a hot-salty-tangy mix of spices that are used in a lot of Indian street foods. Chaat masalas can also be added as a finishing touch to many other Indian dishes, like this chana masala, for instance or an okra fry or just as a seasoning mix for vegetables and paneer. I love sprinkling it over fruit for a spicy fruit chaat. 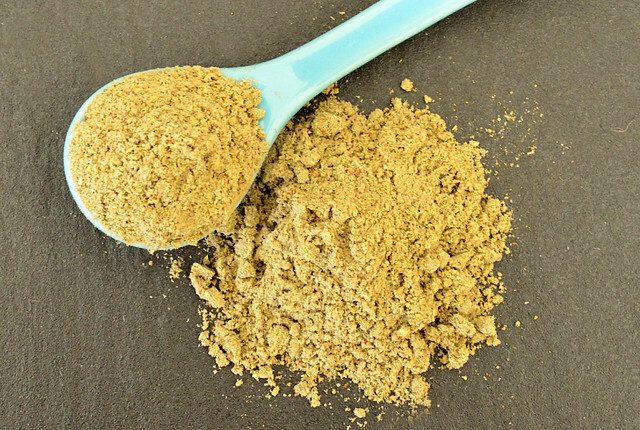 The possibilities of this fragrant spice mix are umpteen, and its one of my favourite mixes in my spice cupboard. Now I buy perfectly good, even fabulous chaat masalas. But then I think... but why not try and make it at home instead? And I try and try and try... and fail miserably. The first time, it was not salty enough. The second time, terribly spicy. The third time not tangy at all. And then finally... just when I was about it give it up as a bad job... success! It took me a long time to perfect this recipe, and I finally feel able to share it here on the blog. 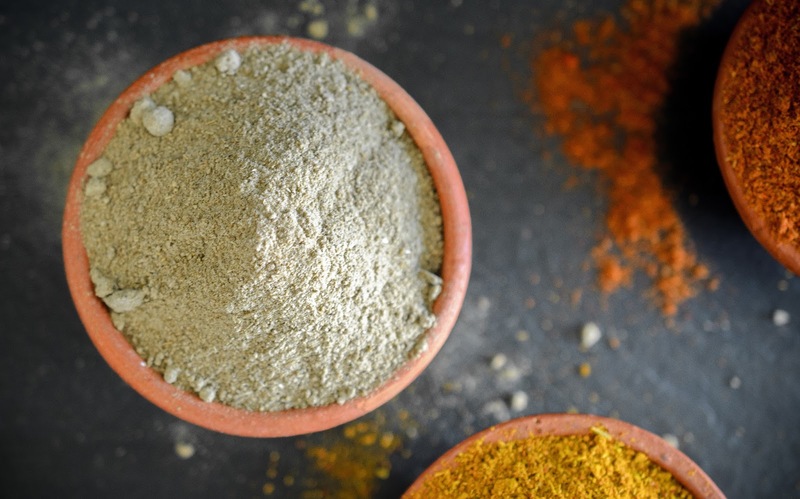 As chaat masala is a finishing spice blend, as opposed to one that is cooked (though you can cook it, if you wish) the majority of the spices that go into it need to be well toasted first, until they are very fragrant. 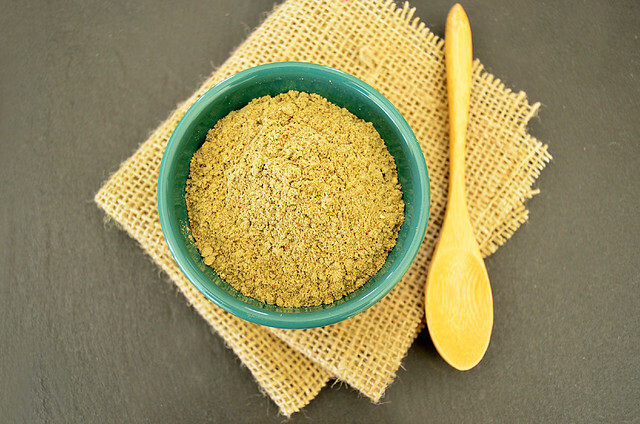 This spice blend also traditionally has salt in it. The usual salt that is used for this mix is called 'kala namak' or black salt, an old fashioned coarse rock salt. This salt adds the smokiness that is so characteristic of this blend. Unfortunately I couldn't find it anywhere here, so I substituted it with a combination of coarse white rock salt, Cyprian black salt (pictured at the end of the recipe) and an amazing Himalayan pink salt. I personally thought that the combination of salts worked fantastically well, even though they were rather expensive. But of course, I will be able to use them for other dishes as well, so money well spent, in my opinion. I was also lucky enough to have homemade dried mint, that my husband dried last year, and I felt that it really added a fresh fragrance and taste to the finished chaat masala. I did, however, run into some trouble. The one elusive spice that seemed to be in every commercial blend was Bishop's Weed. I looked all over for it without any success, until I figured out that it was actually another name for ajwain or carom seeds and then had a facepalm moment... this was a spice that was sitting in my own spice drawer at home waiting for me. Sigh! Keep an eye on the blog as next week I'll be blogging a very summery recipe that'll use this chaat masala. In a hot pan, toast each of the following spices separately *see note - in the quantities listed - whole cumin, whole coriander, fennel, dried pomegranate, black and white peppercorns, ajwain, cloves and chillies. Once each spice is toasted, which will only take about 30 - 45 seconds for each one, place them in a bowl to cool down. Place the toasted spices in a spice grinder and add the dried mint, ground ginger, grated nutmeg, amchur and all the salts. Blend to a fine powder. Taste and add a little more dried mango, if you like your chaat tangier and a little more salt if you want it saltier. Store in an airtight tin, away from direct sunlight. Can be used for a wide variety of savoury preparations, or just sprinkled on fruit for a spicy-tangy kick. If you are a super confident Indian cook, then please feel free to go ahead and toast the spices together. I myself do this when I am short of time. Hi, Michelle! I hope you can make a Herbs & Spices dictionary too, because I'm having the same problem with the 'other names' of these spices. By the way, I always buy black pepper and I ground it myself because some say it's more natural than ground pepper in packs. Is that right? Seasoning beef with herbs & spices really brings out the beef's richest and fullest flavor. I've been using different kinds of herbs and spices whenever I am cooking beef, pork and fish delicacies. 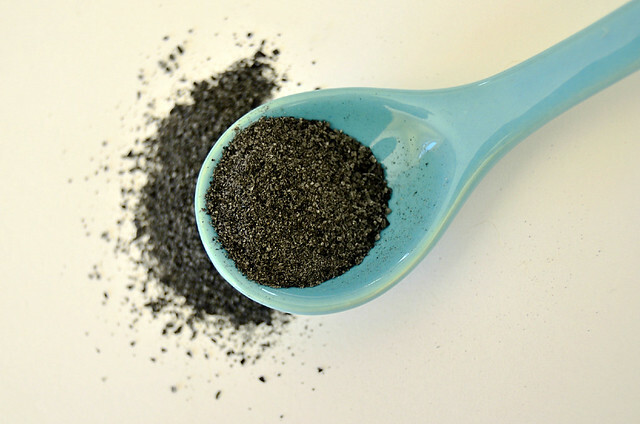 Indian Black Salt can be found at Silk Road Spice Merchants in Calgary, Edmonton and online. They also have Cubeb Berries etc. Hello. I love the descriptions of your spice blends. They sound so yummy and you make it seem so easy to do!! I have a question. You use 3 kinds of salt. Would it be possible to use just 1.5 tablespoons of the kala namak black salt?? I know it has an unusual and strong taste. And although I am new to Indian cooking, I like it! I have purchased a Chaat Masala and put it on fruit sometimes.